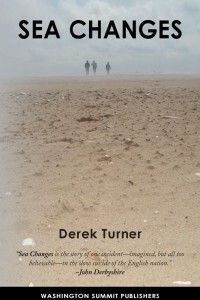 Sea Changes is Turner’s first novel, although he will be known already as the former editor of the conservative magazine Right Now! and the current editor of the Quarterly Review, as well as the author of many articles in venues from the Times of London to Alternative Right and TakiMag. The subject is immigration, and it seems that, on the whole, he’s against it. In Sea Changes, one man’s understandable decision to get out of a Middle East hellhole leads to consequences unimaginable to a poor, simple Iraqi. Chapters alternate between detailing Ibraham’s complex and dangerous trek from post-war Iraq to the British coast, and the increasingly hysterical moral panic that will erupt after things go fatally wrong and Ibraham alone washes up on shore to be dubbed “The Miracle Migrant.” The two strands meet just after the book’s midpoint, and soon a drunken diversity theorist will be smashing windows and graffiti-ing rural cottages, an automotive journalist will be mistakenly curb-stomped by anti-fas, and politicians of the Left and the (respectable) Right will join hands to end democracy. An American might naturally think to find an analogue in Tom Wolfe’s The Bonfire of the Vanities, shifting motifs from fire to water, a journey from firefights in Iraq, by sea, to soggy old Blighty — “It was raining (had it ever been sunny? )” Ibraham muses towards the end. There are, however, subtle differences that would make it inaccurate to approach Sea Changes as a kind of “British Bonfire.” First, Turner is much more of a conscious craftsman than Wolfe. Not to slight Wolfe, one of our legendary stylists, but his knack seems almost ironically Flaubertian, a talent for finding the phrase juste that sums up an occupation — The Right Stuff — or an era –“the Me Generation”; while letting the writing take care of itself, as did the authors of those rambling, ramshackle English realist novels (“baggy monsters” as James called them) that he took for his model. It’s a loose, very British “what the Hell” kind of tradition that was smashed up in the last century largely by a bunch of unruly immigrants from across the water — Americans like James, Pound and Eliot, and most notably Irishmen like Wilde, Joyce, and Beckett — the Revenge of the Subalterns! — as Wolfe might say. And Turner, something of an immigrant himself (born in Dublin and making his way to England in 1988) definitely belongs to the later tradition — he takes his title and epigraph from Ulysses, no less — making the work not merely a piece of reportage or propaganda, but a rewarding literary work in itself. For example, Turner is not content to merely juxtapose the chapters of each plot strand, but takes care to find a suitable style for each. Those dealing with Ibraham’s land and sea voyage are told with an almost Conradian objectivity and sense of Fate — as we’ll see, an appropriate motif for our Moslem migrant. Conrad, another sea-faring immigrant! Dan was running through the hyper-clear farmyard — panting, perspiring, slightly panic-stricken. It was strangely sunny and still [but with] a flaw in the fabric of the place. Secondly, Wolfe’s American situation is importantly different than the British post-War scene. In Bonfire, bond trader Sherman is haplessly caught up in the Establishment’s cynical search for “the Great White Defendant” so that by prosecuting — or persecuting — him “to the fullest extent of the law,” as the signs aimed at shoplifters say, the supposed “color-blindness” of the judicial system can be shown, allowing it to get on with the business of processing from school to prison. Of course, Ibraham is poles apart from über-WASP Sherman, and those fanning the media/political/judicial firestorm aim, in their own minds, to help not harm him and his kind –“Kind”? Racist! — but his manipulation is not in the name of exposing and reforming some definable, old time racist institution, but something far more nebulous and socially disintegrating. The latter, not being a matter of law, had to be sussed out using techniques Liddell calls “prejudice mining,” which “enables states to ‘extract’ new forms of prejudice from behaviour that in previous years would not be considered prejudice by anybody”; and “bundling,” in which unique issues of racism are obfuscated by being submerged in a general notion of “human rights” or “fairness for all.” (I would give as an American example the bundling of “gay marriage” and “the heritage of Martin Luther King;” an especially bold move, considering the overwhelming homophobia of the actual “black community”). Thus, when Ibraham’s doomed fellow passengers wash up on the shore, it’s not investigated so much as it’s used as a pretext to launch a crusade for a Final Solution to “rural racism.” All that’s needed is a tongue-tied yeoman farmer to express sympathy to a reporter using the wrong words – “coloured,” “aliens” — and they’re off. Despite this heavy background, Turner’s novel is no didactic screed, but very much a series of character studies, falling into two pairs, Dan Gowt the resident and Ibraham the migrant; Albert Norman the professional curmudgeon and John Leyden the flash journo. Gowt, an autochthonous Englishman who is taken up by the Powers that Be as the racialist punching bag du jour, and discovers that his England is no more; his fate intertwined with Ibraham, the Miracle Migrant, taken up by the same elite as a symbol of their Caringness and “assimilated” into a dreary, half-assed New Britain that — “vast and indifferent and pointless” — bears no resemblance to the England of his quest. After all, as he had been told in classes at the holding centre, Britain prided itself on its precious traditions of free speech, open media, and fairness. He had traveled storybook distances to reach the auspicious shore and fulfilled the deepest desires of his heart. Yet now that he had done everything he had set out to achieve, he was bitterly aware that he still hadn’t arrived. The journalists, Albert and John, not only illustrate the Old and New Media, but exemplify the moral posturings of the Left and Right. Leyden, the tribune of the underprivileged and oppressed, is a smug, self-absorbed git who despises any “common” person he comes in contact with, psychologically exploits and abuses his live-in girlfriend, and brushes aside his mother’s final illness as just another attempt to “control” him. Albert Norman, despite his aggressively common name, has set himself up as a professional Tory curmudgeon, defending the Olde Ways for no particular reason than to annoy everyone around him, while conducting one of those very British publicly in the closet private lives. Here’s an example of how Turner’s careful writing is not just for style but to make a point — Albert’s longtime companion, despite his Anglophilia and supposed “anti-immigrant“ racism, is a Ghanaian; as we first meet Leyden, he’s “oblivious to the smiling Ghanaian guard” at work, and later, when a Ghanaian human rights activist makes “homophobic” comments at a party, Leyden pays him back by drunkenly imitating his accent to general hilarity, not even noticing him standing at his back. 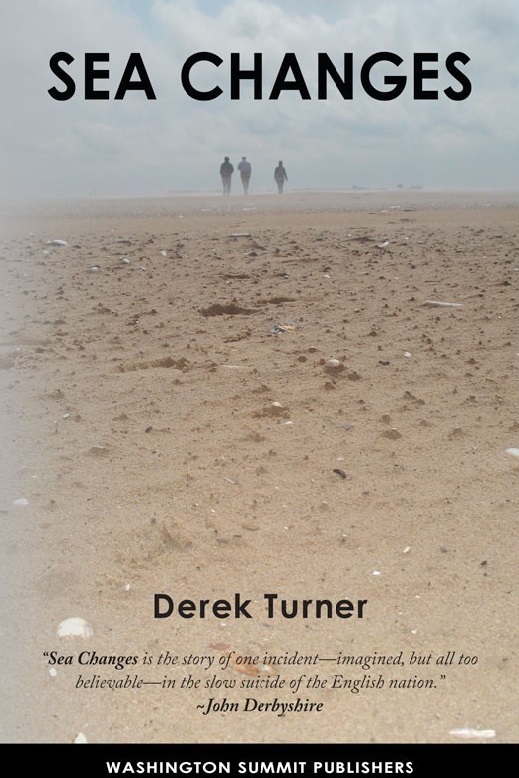 Ultimately, despite obviously reflecting an anti-immigration and generally anti-Left, indeed, anti-Modern, stance, Turner’s novel is objective and, yes, open-minded enough for Ibraham to emerge as the real subject, if not hero. After it all blows over, Dan has gone back to an all too British state of inarticulate country life, meekly accepting inevitable replacement by Modernity; Leyden is condemned to a more and more successful version of his meaningless metropolitan life; Albert, stripped of his newspaper platform, has nothing to do but rattle around in his obsessively Olde English house — Dan himself brushes him aside, a nobody, when he tries to visit at last the rural scene he celebrated in print. His only comfort was a vague superstition that maybe all these tribulations had been “sent.” . . . [D]uring the dangers and difficulties of his journey, he had reevaluated all kinds of things and found himself relying more and more on this psychological prop. As he had moved physically, he had also been traveling extensively inside himself. Just maybe, he thought, he had been foreordained not only to leave, but also to return . . . The troubles at home couldn’t go on forever; they’d be needing men like him to help rebuild. He was still relatively young and could help shape a new reality in what was, after all, his home. Constant Readers will know that prefer my fiction to be concise — in Modernist terms, I’m with Becket or James, not Joyce or Proust — and Sea Changes is a tad too long for my taste. A little less alliteration, perhaps or less details of Leyden’s hip banalities; and Ibraham’s tale all by itself would have been a neat little novella. Still, I found myself pushing ahead, each chapter with some verbal gem or moral insight. It’s hard to believe this is a “first novel,” and I would recommend it to all simply as a damned good book. 1. See Wolfe’s manifesto for The New Realism that opens Johnson and Wolfe’s anthology The New Journalism (1973). 3. Edmund White points out, in his introduction to the Oxford Classics Hardcover edition of Wilde’s The Picture of Dorian Gray (1997) that anyone applying the same level of intense study to a work of Dickens as Joyce required of his readers would go mad. 4. The suggestion of the aristocratic disease of gout is ironic but also appropriate, as both are solidly part of Merrie England; I also think of Frederick “Baron Corvo” Rolfe’s “The Nowt of Holywell,” his self-pitying account of an outsider in rural Wales, from which material would be later drawn for his own persecution by the news media. 5. The Occidental Observer, April 17th, here. The life peerage gambit also appears in Sea Changes, but only to dispose of a White politician, not to appease Ibrahim’s folks.